The embattled Republic reels from the attacks of Grand Admiral Thrawn, who has marshaled the remnants of the Imperial forces and driven the Rebels back with an abominable technology recovered from the Emperor’s secret fortress: clone soldiers. As Thrawn mounts his final siege, Han Solo and Chewbacca struggle to form a coalition of smugglers for a last-ditch attack, while Princess Leia holds the Alliance together and prepares for the birth of her Jedi twins. The Republic has one last hope—sending a small force into the very stronghold that houses Thrawn’s terrible cloning machines. There a final danger awaits, as the Dark Jedi C’baoth directs the battle against the Rebels and builds his strength to finish what he already started: the destruction of Luke Skywalker. The narration was excellent! The character's voices and sound effects was also excellent! Love the writing and the reading. Masterfully done. This book was my favorite in the series. I am however extremely disappointed with what happens to one of the main characters at the end of the story. Good book, good series. Loved all three in the the trilogy. Audio Star Wars are THE BEST! 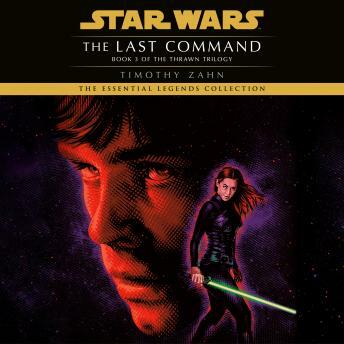 Thrawn's arc come to an end in this wonderfully produced audiobook. Bravo, the series has captured Thrawn perfectly. Really enjoyed the series. Narration is great. The narration was on point!